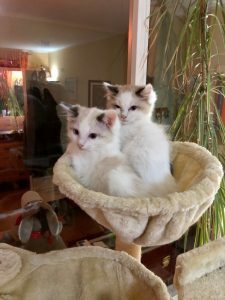 Following on from our failed search for a cat, we had made contact with someone in Brno (CZ), who had some ragdoll kittens for sale. She offered to come to Munich so we could see them,but we said we would goto her. It would be less stress for the kittens if we didnt want them and we could see the mother and father as well. 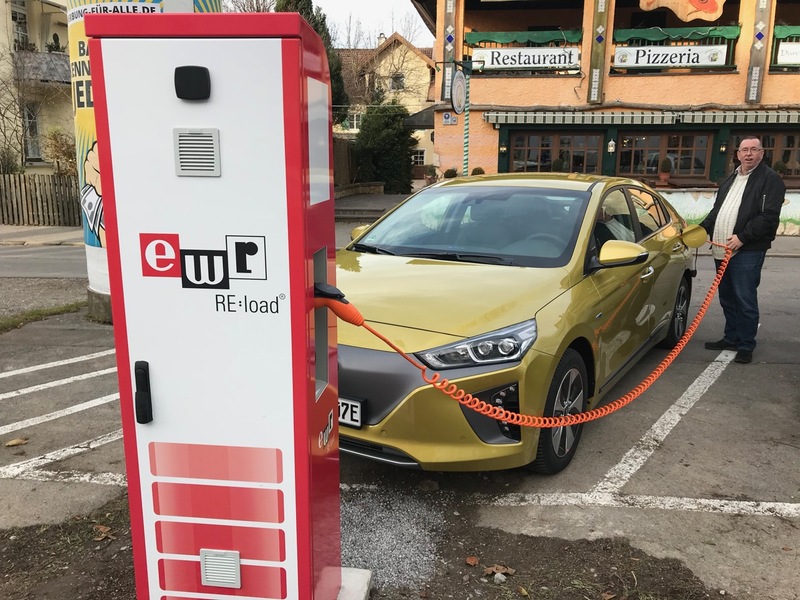 The only problem is the Czech EV charging network. The only access to it is with a contract at €15 a month. They are not connected to any roaming network, nor is there a pay as you go possibility. I took the step of writing to the network owners telling them how tourist unfriendly there network is, and I actually got a reply which in a nutshell said. “so what!”. This mean of course the best route over Prague was a nonstarter for us. The best alternative was to drive to Vienna,and then go straight north via the shortest route possible, and back the same way. Each way would be close to 600Km. As this probably wasn’t going to be possible to go there and back in a day, I looked for a hotel in Brno with a charger. I found one that had a Tesla destination charger. I emailed them and they confirmed they had 2 points. This meant that one was free for non-tesla usage as well. A trip of 600Km was going to be our longest trip to date. I already had a Smatrics app and account so I foresaw no major issues with charging. Going to Brno we charged 9 times. The motorway was taking its toll and it was very cold. Our last charge in Austria was at Hochleiten and it was with a very uneasy feeling that I entered the Czech republic. The destination in Brno was about 90Km away, so if the hotel charger didn’t work, I would have enough charge to get about half the way back to the charger. We bought two Ragdolls from the breeder and set off for home on Sunday. Brno looks like an nice place to visit sometime, when its warm. As we had the two kittens in the car, we didn’t look around. On the way home we took a different route and only recharged 5 times. It was still bitterly cold. One thing that irritates me a bit is that some chargers close on Sundays, and after shopping hours. Now I understand Lidl & Co put in the chargers to attract customers, and that is super, but I think it might be a two edged sword as the local councils my have less incentive to install rapid chargers. This in turn means outside of store hours transit traffic can have problems getting a charge. Please Lidl & Co leave the chargers on 24/7, even if that means we have to use a roaming card like Plugsurfing or The NewMotion to pay for the chargers. Free is good, open 24/7 is better. 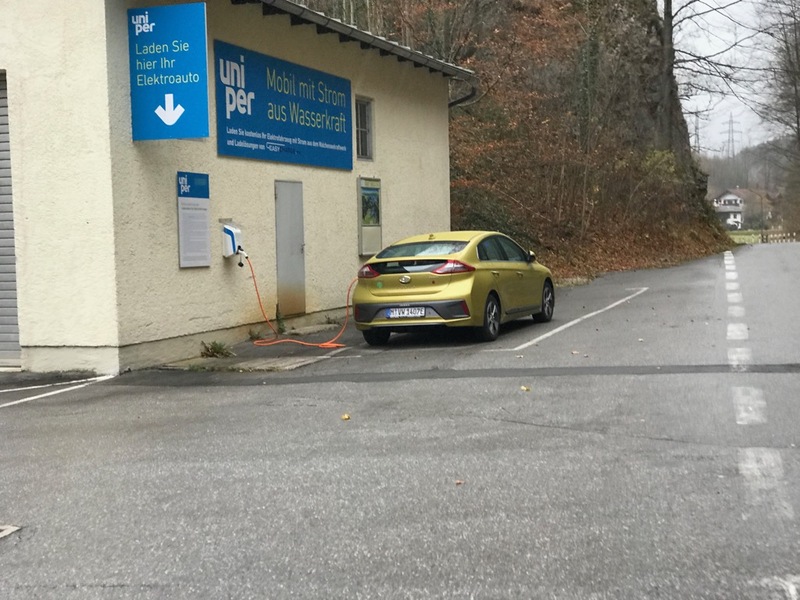 I found charging in Austria to be expensive. The distance covered was 1193Km and the total electricity cost was €108,76 which works out at almost 11 cent per Km. The killer in these cost were the adhoc charging rate and the €1 start charge. The charge locations and costs are below. It was empty in the apartment without a cat so we started looking around and decided on a ragdoll, which in tern mean we had to make trips to visit breeders. 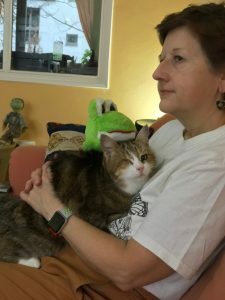 One weekend we visited 2 breeders in the Bayerischer Wald and somewhere east of Nuremberg neither had what we were looking for, but it did confirm the type of cat. Even thought we didn’t find what we were looking for the trips in the area were excellent. Both areas were places we had never been to before and certainly and area that in summer I will drive in again. I am a cat person. We had a really lovely cat called Cyclops. She was so named because she only had one eye. She was as daft as a bat, very loving and a stay at home cat. She would spend the whole day on the balcony during the summer and never once tried to leave its safety. She was also quite a sick cat. When we got her, at the age of 6 months, we were told she would only live a year or so. Toward the end of 2017 she started to deteriorate rapidly. She was 9 years old. Its always sad to loose a loved pet, especially one who was so loving, but we had to let her go for her own good. We didn’t want to see her suffer. Car tax demand. Are you joking ? When you buy an EV in Germany, you gat a few advantages from the state, such as the €4000 refund on the purchase price. Strictly speaking its €2000 with a matching €2000 from the EV maker. This is in addition to any other discount you maybe able to negotiate. I didn’t need to negotiate, our dealer gave a very fair price without asking bringing the car about €7000 below list price. You also get a 10 year no road tax period. The strange thing is you still get a tax demand payable in 10 years time by direct debit. I have forgotten how much the demand is for, I think something silly like €10 or €50. In any case, I doubt in 10 years time we will still own this car. Additionally you can get a numberplate with an E at the end. In some areas this gives privileges such as free parking or bus lane usage. The only problem is this is regulated at the local, not national, level, so you never know whats allowed or not. So in practice, there is little advantage in having an E plate, but at least there is no extra charge to have it. About me and how we came to get an EV. 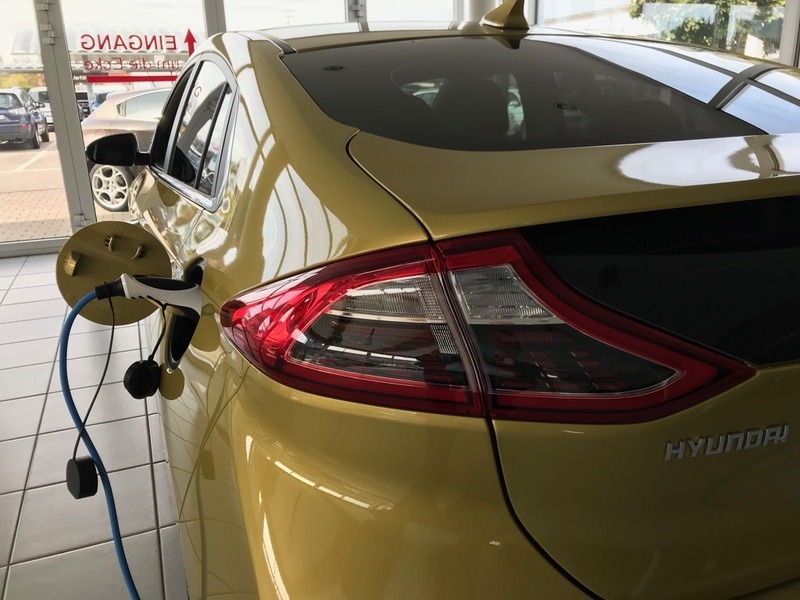 Welcome to my blog about my experiences owning an Electric Vehicle, specifically a Hyundai Ionic Electric. 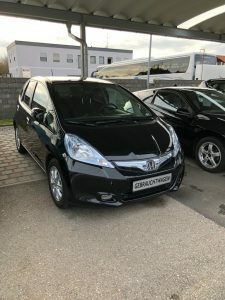 In this blog I aim to cover our journeys, advantages and disadvantages of owning an EV and any problems we encounter. About me: My name is Victor, I am by birth a UK citizen, but have also German nationality by choice. My professional background is varied having held a range of positions from quality assurance, flight simulation, computers system management, satellite control to retail sales. I am now close enough to retirement that my professional future is no longer important compared to other things in life. One of my main interests is travel. Time doesn’t allow as much travel as I would like, unfortunately, but in the past I have travelled extensively. I also love technology and have often been an early(ish) adopter of new technology. I had my first hybrid car before they were cool, at a time when peoples first question was “Whats a hybrid?”. I was for a long time someone who laughed at the idea of an EV. I live in Munich, in an apartment, and the garage I had was without power, with no option of getting any power installed. My position on EV was, “I drive it from the dealer to home, and then what? I cant charge it, so its useless.” At that time public chargers were rare. One of my colleagues had a Twizzy, and then a Smart EV and I use to pull his leg about where he put the AA batteries so he could use it. I should say I find the Smart (in any form) a comical car anyway. However I was also interested in his experiences and often talked to him about his experiences. In time I signed up for DriveNow, so that I could have access to a car if I had issues with mine. I didn’t use DriveNow for about 2 years, but for some, now forgotten, reason I had 60 minutes usage available on my account, so with my wife we took out a BMW i3 for a spin. I was hooked. The experience was a real eye opener. We talked about buying an i3, and even opened an account at the BMW Bank with the thought of saving up for one. I must say however, the BMW configuration utility is such a horrible thing that I never was able to figure out exactly how much an i3 would finally cost. I had been reading all sorts of websites, looked at loads of youtube videos and consumed just about all the info I could on EV, but was concerned about range and price. I went to look at a Nissan Leaf. The dealer asked where I would charge it and stated there was only one charger in Munich. I was a bit shocked at this statement. He didn’t offer us a test drive, so we left the dealer. We looked at a few other EV’s such as a Renault Zoe, where the dealer was with another customer and the receptionist said come back another time as she had no clue, and a Mitsubishi i-MiEV from outside (the dealer was closed). We put the idea of an EV on the back burner as a no go option and bought another hybrid. Spring 2016. I watched the presentation of the Hyundai Ioniq range and for the first time I saw an EV that I thought was practical. A range of 280KM and a nice looking car with lots of bells and whistles. There were just 2 issues. Out Hybrid was only a year old, and the Ioniq Electric wasn’t due to be released until summer, or autumn …. no one really knew. Seeing the presentation I knew this was a very big contender. I had by this time decided I didn’t want another pure hybrid, but maybe a plugin hybrid or an EV. My argument for a plug in is that a couple of times a year I must drive to west France, about 1200km away, and from my research on the leaf, I though with an EV this trip would be difficult to impossible. 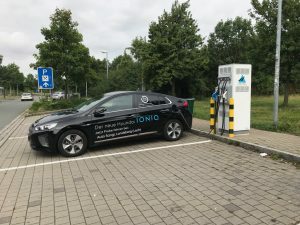 That summer the Ioniq was stuck on my mind, and it would be for almost 18 months. Each trip we took, where ever it was, I was looking for and checking out EV charging stations. My conclusion was there were more than enough to cover all our normal tips, but France could be tricky. Over the next 18 months I drove to France 3 or 4 times, as well as to Milan. One a couple of occasions we “simulated” a trip with an EV with a 200Km range, and said, we would route via chargers, and check them out. Italy appears to (still) be a nightmare. We saw 1 CCS in Milan, but after that none at all going back over the Brenner pass. I have since found one at Brenner and a few others around Merano and Vipitino, but I still find Italy a worrying place to drive to, but more on that in another post. France is different. Well, the French have their own ways, and I found a fair few Type 3c chargers which are not only slow, but really incompatible with modern EV’s. Do any new EV still support 3c? There is a reasonably good rollout of CCS triple chargers on the autoroutes and a large number of slow chargers (type 3c and some type 2) at supermarkets. But, and it is a big but, the rollout of chargers appears to stop to the west of a line drawn south from Paris. Of course, this is exactly where I need to go. Basically from Auxerre too Tours, there are no CCS chargers, just a couple of Chademo. On the A10, a charger was installed 2 years ago, but it has never been activated. But I digress. Following a lot of talking with my wife, we decided that the long trips we make doesn’t warrant carrying around a motor that we will hardly need, not to mention the extra servicing costs due to the more complex systems installed in the car. So a plugin hybrid was also ruled out and we were back to a pure EV. 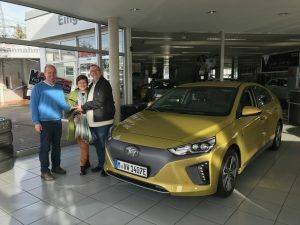 By spring 2017 I had heard that Autohaus Sangl in Landsberg am Lech had an Ioniq Electric on the forecourt so we took a drive out to take a look. We were looking at it when Jürgen Sangl came upto us and we said we were looking at the Ioniq. The next thing I knew I was in one taking a test drive. I was totally unprepared so we just did a 15 min or so drive to get a feel for it. I was impressed. We had also short listed 2 other EV, the Kia Soul and the Renault Zoe. We never got to test drive the Soul. I contacted Kia, they would get a dealer to call me, but the call never came. 3 times Kia called, 3 times I told them no dealer had contacted me. Renault was a bit better. Again via the Renault website I booked and got a confirmation for a 48 hour test drive. At the appointed date I turned up at the dealer and they had no car. They said they had no information about a test drive, but if I went back in the afternoon they would have one for me for 24 hours. I don’t know which specification the test drive EV had but I just didn’t like it. It drove well enough, but after an hours drive, we had to plug it in for an hour to recharge. I can only assume it had the 20Kwh battery and slow charger. We drove to Augsburg and back, and on Sunday we struggled to get to friends in Selb, and gave up after 4 hours. It was painful. I also didn’t like the Navi or the eco mode limit of circa 90Kmh which I found dangerously slow on the autobahn. On giving the car back I told the dealer my concerns, thanked him and left. I also mentioned to him that having no RFID card in the car could an issue for a test drive. Lucky for me I had already obtained my own one. Returning the car to Sangl, we had a good chat about the purchase options and delivery was stated as December. We didn’t place an order but on the way home In our Hybrid, which now sounded so loud and felt ancient, I asked my wife if she agreed to getting one. She said yes. We waited until end of September before we returned to Sangl and placed an order. We wanted a sun roof, but that would make a years waiting time. I was a bit taken aback as I had expected December/January. Other options were talked about and we decided a sun roof wasn’t so important, and Jürgen told use there was one available in the colour we wanted in May. We made the order and arranged a trade in value for our hybrid. and settled in for a long wait. At the end of October, I had an email out of the blue from Jürgen that there was a car available for December, did we want it….Silly question! We collected our car on the 27th November, even earlier than the email had suggested. When your using a new technology for the first time, there are two strategies. Open the box with a devil may care attitude and push it to its limits or peek inside the box and take baby steps whilst getting use to it. I tend to the latter. 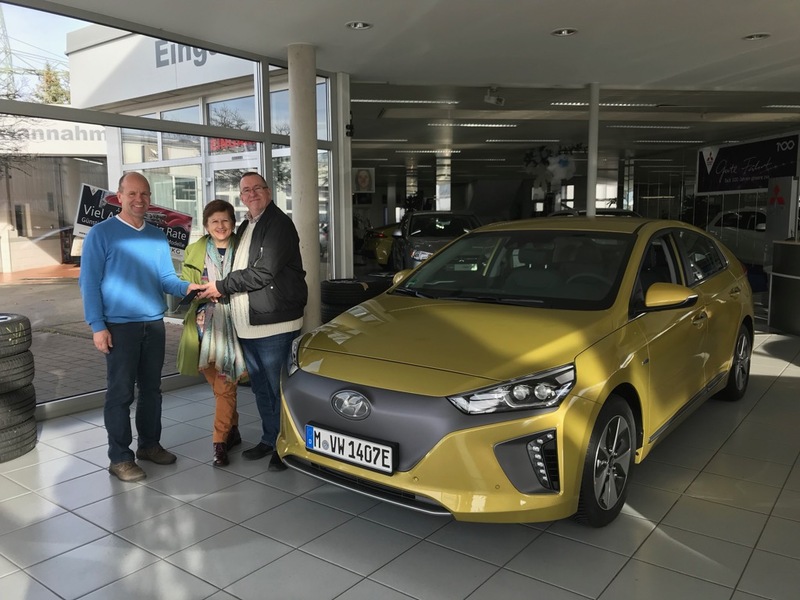 We collected our Ioniq, which we named “Heart ofGold” after the spaceship in “The Hitchhikers Guide to the Galaxy” due to the synthesised engine sound at low speed, at the very end of November. Our first few trips were quite short, maybe 200km or so each time, with plenty of charging stops. I remember a youtube vlogger saying “with an EV remember ABC – Always Be Charged”. The first few weeks I really took this to heart, charging every time I saw a charger (almost). WE ventured as far as Innsbruck in Austria. Really no distance at all but it felt like a big adventure. Would we find a charger? Would our RFID cards work? How much will roaming cost? and so on. Needless to say all our fears were unfounded. Up to today we have never been unable to find a charge. We have come close to it on 2 occasions, once during the test drive and once during a very very cold trip in an area with few chargers. On that occasion we had about 15Km left and the intercharge charger we stopped at wouldn’t work Calling the support number was like hitting my head against a brick wall. So unhelpful, but they did happily take my money for a charge session that never worked. With next to no power, in -10C and little hope I was about to call Hyundai Assistance when I saw in another app, that there was another charge point 10Km away on the autobahn in the direction we were going. I took those 10KM very carefully and much to my surprise made it with power to spare. Would this charger start ? This was the only time I really had range anxiety. The charge started and completed without problem. The return journey also turned out to be “interesting” as it snowed heavily whilst we were at a friends house, and most of the autobahn was reduced to 30-50Km/h. Our range was down to about 130Km per charge due to the snow and cold temperature. One of the chargers we needed to use was blocked by a coach but I managed to squeeze around him to the charge point probably blocking him, but hey he shouldn’t have parked in a clearly marked EV only parking place. One other charger I was about to pull into the charger and there was another car that reversed into the EV charging place. I leant out of the window and pointed to the charger and told the driver I needed that space for the charger, and she apologised and moved her car over to another spot. As my confidence in the range improved so did the distance we covered on our days out.